Saint Brigid's Church, originally uploaded by johnwmacdonald. The final mass in Saint Brigid's Roman Catholic Church is set to be celebrated 16 September 2007 at 10am. Parishioners are awaiting an 11th hour Vatican appeal to halt the sale of the 117 year-old building which was designated a heritage property in 1981 by the City of Ottawa. 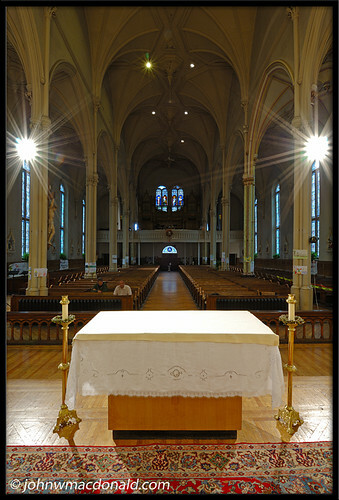 According to a recent article in the Ottawa Citizen, "The archdiocese plans to amalgamate most of St. Brigid's parishioners with Notre-Dame Cathedral. An Irish community group has pledged to buy the property - including the rectory - for $450,000 and transform the building into an Irish-Canadian cultural centre. Patrick McDonald, a spokesman for the prospective owners, said the group would work to address the problem once the sale is finalized - expected later this month."